The output shows 0x411 as the size of the both chunk, which is 1024 + 17 bits for whatever. This is the the first (and only) piece of information in the header for both chunks. However, I don't see any info relating to any previous chunks. 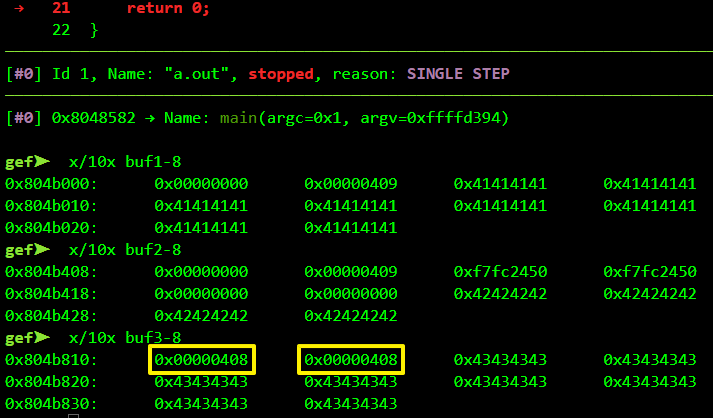 In Shellcoder's, the author is trying to demonstrate how one can overflow buf1 to overwrite the header info of buf2. Did the writers of glibc forgo the size of previous chunk in the header info, or is it something I'm missing? The diagram you linked to seems to be wrong. The size of the previous chunk is stored in the current chunk iff, the previous chunk is free. This image is more appropriate of what an allocated heap chunk looks like. Lets take the following code to demonstrate this. Note: Instead of two chunks, I'm taking three chunks or otherwise freeing the first may coalesce it into the top chunk. We will free the middle chunk and examine the chunk contents before and after the free call is executed. The binary was compiled with gcc -m32 -g ./heap.c. 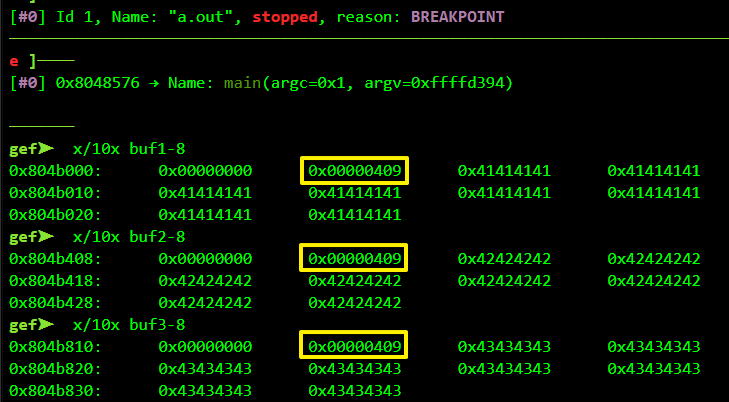 Debug the binary in gdb as you would normally and set a breakpoint on line 20 at the free(buf2) call. When the breakpoint hit, let's examine the three chunks. malloc returns the pointer to chunk + 8, so we subtracted 8 from each of the addresses. Additionally, I've also highlighted the chunk sizes (2nd member of a heap chunk) in the above image. However the chunk sizes are not actually 0x409 . Glibc heap chunks are always aligned to 8 bytes which means the last three bits are always zero. Hence, these three bits are used for storing other information (A, M and P bits). 0x409 when converted to binary comes out to be 100 0000 1001. To get the true chunk size we have to discard the last three bits (A M P) i.e. we should consider only 100 0000 1000. When this is converted to decimal we get 1032. The true chunk size is indeed 1032. 1024 bytes for our data and the other 8 for the first two members. 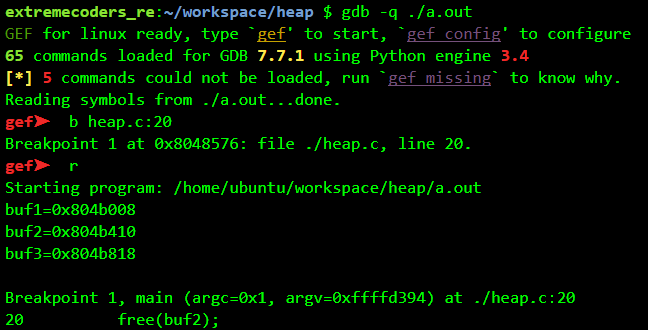 Coming back to gdb, lets step over the free call and examine the chunks once again. Chunk 2 has been freed. Let's have a look at chunk 3 (buf3). The first member of chunk 3 now contains 0x408 which is 1032 in decimal - this is the size of chunk 2. 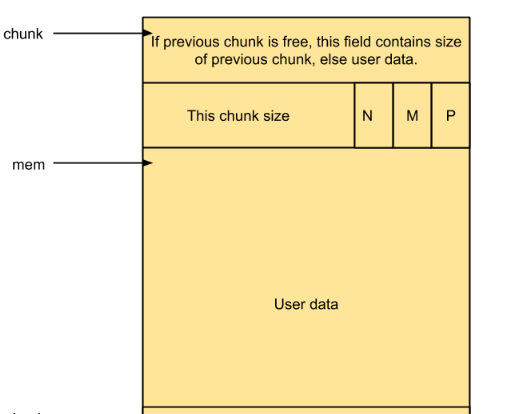 Thus the previous size is stored in chunk 3 only after chunk 2 has been freed, not when it is in-use. The P bit I was referring before stands for PREV_INUSE. This bit is set when the previous chunk is in use. Since the previous chunk is now free this bit is set to 0. As a result the second member now also contains 0x408 (instead of 0x409) which equals 100 0000 1000. As shown in the image above, the P bit is unset. Hope, this clears your understanding. Not the answer you're looking for? Browse other questions tagged binary-analysis radare2 exploit shellcode heap or ask your own question.